Lincolnshire Aviation Heritage Centre, East Kirkby – Lancaster ‘Just Jane’ photo day, March 2013. (Pic: Harry Measures). A small site at Hagnaby was first used as a ‘K’ Type decoy, designed to attract enemy aircraft away from Coningsby and Manby. The decoy ceased operation on 27 Jun 1941 and approval was given in August for construction of a Class ‘A’ bomber airfield with work being carried out between 1942-43. This became RAF East Kirkby. East Kirkby opened in August 1943 as an airfield in 5 Group. It had the usual three intersecting runways linked by a perimeter track.The technical site was located to the north, just off the A155 and contained two of the three hangars – a T2 and later a B1. The second T2 was located off the eastern perimeter track. A further four T2 hangars were constructed on the technical site when East Kirkby became the parent station of 55 Base, responsible for the administration and aircraft maintenance of Spilsby and Strubby. The communal and accommodation sites were located in fields north-west of the A155, whilst the bomb stores were located to the north-east, at the site of the former decoy. The Lancasters of 57 Squadron arrived at Scampton on 29 August 1943. On 15 November 1943, ‘B’ Flight 57 Squadron was expanded to form 630 Squadron. A major incident occurred at the airfield on 17 April 1945. Whilst loading bombs in preparation for a raid on the marshalling yards at Chem, south west Germany, a 1,000 lb bomb exploded, causing a chain reaction – six Lancasters from 57 Squadron were destroyed and 14 suffered damage. There were 17 casualties, four of which were fatal. Following Victory in Europe Day, 8 May 1945, East Kirkby became a work-up base for aircraft designed for Tiger Force – created as part of the proposed Allied invasion of mainland Japan. Both 57 Squadron and 460 Squadron were to contribute aircraft which would form 533 Wing. 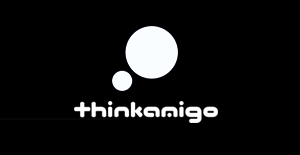 However, the atomic bomb attacks on Hiroshima and Nagasaki forced the Japanese to surrender and the need for the Tiger Force ceased. On 18 July 1945, 630 Squadron was disbanded as it was not required for the force, its place being taken on 27 July by 460 Squadron RAAF. After the surrender of Japan, East Kirkby was retained by the RAF on Care and Maintenance. Between 1951-58, the United States Air Force Strategic Command took over the airfield, redeveloping it. Existing facilities were refurbished and a large aircraft parking area laid near the four T2 hangars. The east-west runway was extended eastwards by 1,226 yards making the overall length 2,626 yards. East Kirkby closed in 1958. 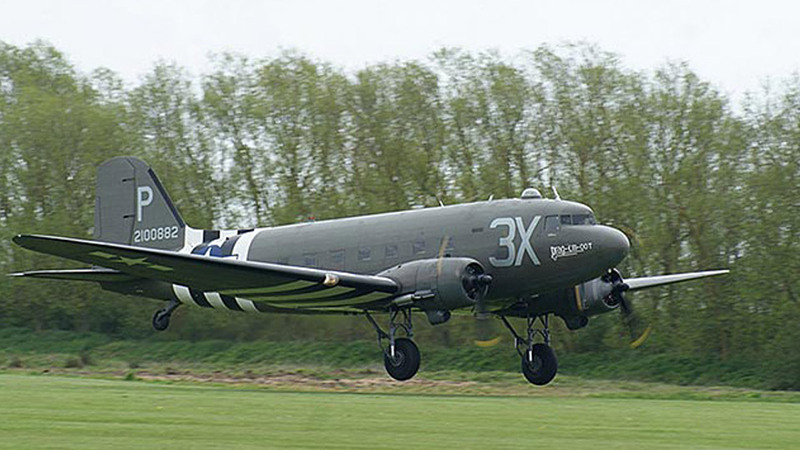 East Kirkby’s resident Dakota ‘Drag Em Oot’ N5831B takes to the air. (Pic: Paul King). 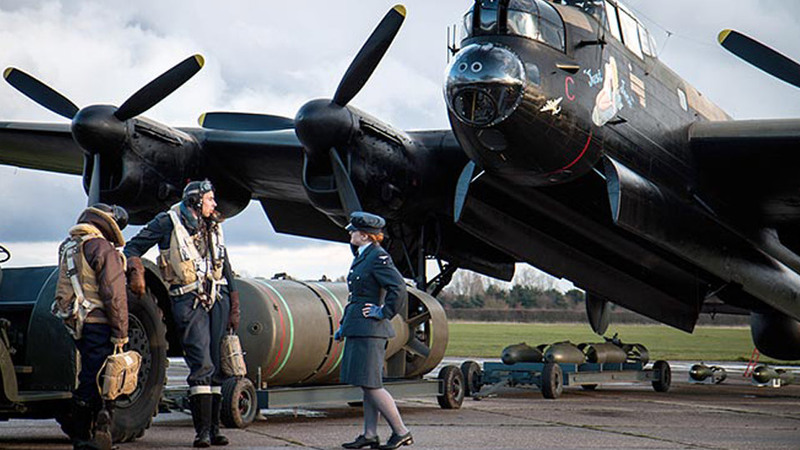 Today, East Kirkby is well known as the home of ‘Just Jane’ the Lancaster bomber restored to taxiing condition. Part of the airfield forms the Lincolnshire Aviation Heritage Centre. 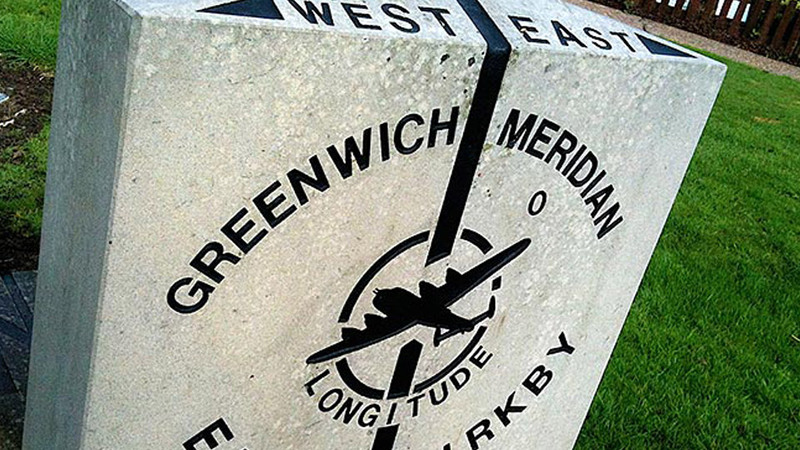 Zero degrees Longitude at East Kirkby. (Pic: Paul Fillingham).